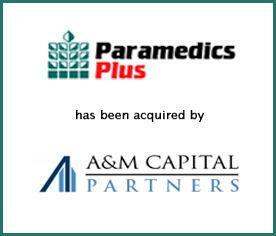 Paramedics Plus, LLC has been acquired by A&M Capital Partners, LP to form Paramedics Logistics Operating Company, LLC (Paramedics Logistics). Paramedics Logistics was acquired from previous owner UT Health, formerly known as East Texas Medical Center Regional Healthcare System. The transition of Paramedics Logistics to the new ownership is expected to create new growth opportunities for its employees while continuing to deliver service and innovation for the patients and communities where they live and work. Provident Healthcare Partners (“Provident”) served as exclusive financial advisor to Paramedics Plus and UT Health East Texas. The terms of the transaction were not disclosed. Paramedics Logistic provides exclusive emergency and non-emergency ambulance services in California, Florida, South Dakota, Indiana and Texas, under 25 exclusive performance-based contracts. “Under previous ownership, Paramedics Logistics assembled one of the best management teams and field staff in the country. With the capital, operational resources, and pedigree of A&M Capital, Paramedics Logistics is now positioned to accelerate its growth through securing new contracts and acquisitions,” commented Steven Aguiar, Managing Director of Provident Healthcare Partners. “I am thankful to the Provident team for their thoroughness and efforts throughout this process. Provident has provided outstanding guidance and counsel, and this deal would have never closed without Provident,” stated Ron Schwartz, President of Paramedics Logistics. Paramedics Logistics employs over 1,300 EMTs, paramedics and registered nurses. Its ambulances are leading-edge mobile units that bring the emergency services of a hospital directly to the patients’ side. Committed to excellence, each of the Company’s operating sites are accredited to the gold standard by the Commission on Accreditation of Ambulance Services (CAAS) and each of the operating sites communications centers that the Company controls are accredited as an Accredited Center of Excellence (“ACE”). Florida, South Dakota, and Texas operations. For more information, visit http://www.paramedicsplus.com/.